The Nestle Boost Glucose Control Nutritional Chocolate 8oz BrikPak 27-Case, Model #36020000, is anchored in advanced science and research. Nestle Healthcare Nutrition offers nutritional solutions for people with specific dietary needs related to illness, disease states or the special challenges of different life stages. 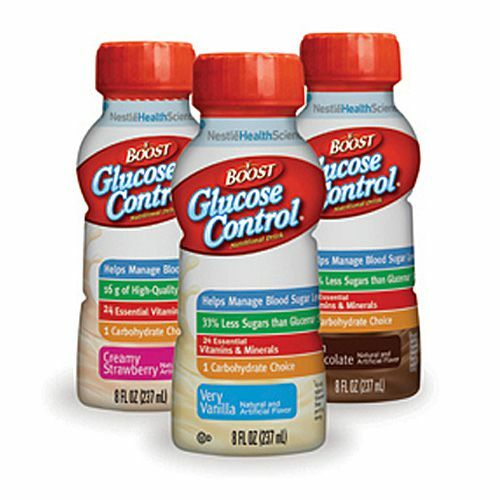 The Nestle Boost Glucose Control Nutritional Chocolate 8oz BrikPak Case of 27 contains a unique blend of protein, fat and slow-digesting carbohydrates designed to help manage blood glucose levels as part of a balanced diet for those with diabetes. Fiber blend helps support digestive health and normal bowl function. Boost Glucose Control is suitable as an oral supplement, snack, or minimeal. Contains CalciLock blend of essential nutrients to help support bone health. General Oral Supplement needs for people with diabetes. Case of 27 Boost Glucose Control 8oz Tetra Brik. NOT FOR PARENTERNAL USE: This product is a medical food intended for use under medical supervision. It is not intended to diagnose, treat, cure or prevent disease.